This article is about the Egyptian deity. For other uses, see Ra (disambiguation). In one of his many forms, Ra, god of the sun, has the head of a falcon and the sun-disk inside a cobra resting on his head. Ra (/rɑː/; Ancient Egyptian: rꜥ or rˤ; also transliterated rˤw; cuneiform: 𒊑𒀀 ri-a or 𒊑𒅀ri-ia) or Re (/reɪ/; Coptic: ⲣⲏ, Rē) is the ancient Egyptian deity of the sun. By the Fifth Dynasty in the 25th and 24th centuries BC, he had become one of the most important gods in ancient Egyptian religion, identified primarily with the noon sun. Ra was believed to rule in all parts of the created world: the sky, the Earth, and the underworld. Ra was portrayed as a falcon and shared characteristics with the sky god Horus. At times the two deities were merged as Ra-Horakhty, "Ra, who is Horus of the Two Horizons". In the New Kingdom, when the god Amun rose to prominence he was fused with Ra into Amun-Ra. The cult of the Mnevis bull, an embodiment of Ra, had its center in Heliopolis and there was a formal burial ground for the sacrificed bulls north of the city. All forms of life were believed to have been created by Ra. In some accounts humans were created from Ra's tears and sweat, hence the Egyptians call themselves the "Cattle of Ra". In the myth of the Celestial Cow it is recounted how mankind plotted against Ra and how he sent his eye as the goddess Sekhmet to punish them. To the ancient Egyptians, the sun represented light, warmth, and growth. This made the sun deity very important, as the sun was seen as the ruler of all that he created. 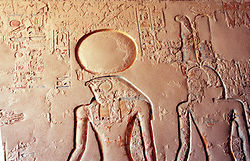 The sun disk was seen as either the body or the eye of Ra. Ra was the father of Shu and Tefnut, whom he created by his own power. 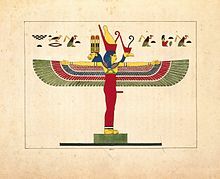 Shu was the god of the wind, and Tefnut was the goddess of the rain. Sekhmet was the Eye of Ra and was created by the fire in Ra's eye. She was a violent lioness sent to slaughter the people who betrayed Ra, but when pacified she became the more benign goddess Hathor. Ra was thought to travel on the Atet, two solar barques called the Mandjet (the Boat of Millions of Years) or morning boat and the Mesektet or evening boat. These boats took him on his journey through the sky and the Duat, the literal underworld of Egypt. While Ra was on the Mesektet, he was in his ram-headed form. When Ra traveled in his sun boat, he was accompanied by various other deities including Sia (perception) and Hu (command), as well as Heka (magic power). Sometimes, members of the Ennead helped him on his journey, including Set, who overcame the serpent Apophis, and Mehen, who defended against the monsters of the underworld. When Ra was in the underworld, he would visit all of his various forms. Apophis, the god of chaos, was an enormous serpent who attempted to stop the sun boat's journey every night by consuming it or by stopping it in its tracks with a hypnotic stare. During the evening, the Egyptians believed that Ra set as Atum or in the form of a ram. The night boat would carry him through the underworld and back towards the east in preparation for his rebirth. 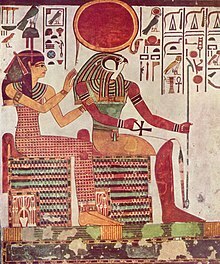 These myths of Ra represented the sun rising as the rebirth of the sun by the sky goddess Nut; thus attributing the concept of rebirth and renewal to Ra and strengthening his role as a creator god as well. When Ra was in the underworld, he merged with Osiris, the god of the dead. Ra was worshipped as the creator god among some ancient Egyptians, specifically followers of his cult at Heliopolis. It was believed that Ra wept, and from his tears came man. These cult-followers believed that Ra was self-created, while followers of Ptah believed that Ra was created by Ptah. In a passage of the Book of the Dead, Ra cuts himself, and his blood transforms into two intellectual personifications: Hu, or authority, and Sia, or mind. Ra is also accredited with the creation of the seasons, months, plants, and animals. Ra-Khepri (solar disc and scarab beetle). Ra was represented in a variety of forms. The most usual form was a man with the head of a falcon and a solar disk on top and a coiled serpent around the disk. Other common forms are a man with the head of a beetle (in his form as Khepri), or a man with the head of a ram. Ra was also pictured as a full-bodied ram, beetle, phoenix, heron, serpent, bull, cat, or lion, among others. He was most commonly featured with a ram's head in the Underworld. In this form, Ra is described as being the "ram of the west" or "ram in charge of his harem. In some literature, Ra is described as an aging king with golden flesh, silver bones, and hair of lapis lazuli. The chief cultic center of Ra was Iunu "the Place of Pillars", later known to the Ptolemaic Kingdom as Heliopolis (Koinē Greek: Ἡλιούπολις, lit. "Sun City") and today located in the suburbs of Cairo. He was identified with the local sun god Atum. As Atum or Atum-Ra, he was reckoned the first being and the originator of the Ennead ("The Nine"), consisting of Shu and Tefnut, Geb and Nut, Osiris, Set, Isis and Nephthys. The holiday of "The Receiving of Ra" was celebrated on May 26 in the Gregorian calendar. Ra's local cult began to grow from roughly the Second Dynasty, establishing him as a sun deity. By the Fourth Dynasty, pharaohs were seen as Ra's manifestations on earth, referred to as "Sons of Ra". His worship increased massively in the Fifth Dynasty, when Ra became a state deity and pharaohs had specially aligned pyramids, obelisks, and sun temples built in his honor. The rulers of the Fifth Dynasty told their followers that they were sons of Ra himself and the wife of the high priest of Heliopolis. These pharaohs spent most of Egypt's money on sun temples. The first Pyramid Texts began to arise, giving Ra more and more significance in the journey of the pharaoh through the Duat (underworld). During the Middle Kingdom, Ra was increasingly affiliated and combined with other chief deities, especially Amun and Osiris. Ra on the solar barque. At the time of the New Kingdom of Egypt, the worship of Ra had become more complicated and grander. The walls of tombs were dedicated to extremely detailed texts that depicted Ra's journey through the underworld. Ra was said to carry the prayers and blessings of the living with the souls of the dead on the sun boat. The idea that Ra aged with the sun became more popular during the rise of the New Kingdom. Many acts of worship included hymns, prayers, and spells to help Ra and the sun boat overcome Apep. The rise of Christianity in the Roman Empire put an end to the worship of Ra by the people of Egypt. Ra and Amun, from the tomb of Ramses IV. "Ra-Horakhty" redirects here. For the Egyptian month named in his honor, see Mesori. As with most widely worshiped Egyptian deities, Ra's identity was often combined with other gods, forming an interconnection between deities. Amun was a member of the Ogdoad, representing creation energies with Amaunet, a very early patron of Thebes. He was believed to create via breath and thus was identified with the wind rather than the sun. As the cults of Amun and Ra became increasingly popular in Upper and Lower Egypt respectively they were combined to create Amun-Ra, a solar creator god. It is hard to distinguish exactly when this combination happened, but references to Amun-Ra appeared in pyramid texts as early as the fifth dynasty. The most common belief is that Amun-Ra was invented as a new state deity by the Theban rulers of the New Kingdom to unite worshipers of Amun with the older cult of Ra around the 18th dynasty. Amun-Ra was given the official title "king of the gods" by worshippers, and images show the combined deity as a red-eyed man with a lion's head that had a surrounding solar disk. Atum-Ra (or Ra-Atum) was another composite deity formed from two completely separate deities, however Ra shared more similarities with Atum than with Amun. Atum was more closely linked with the sun, and was also a creator god of the Ennead. Both Ra and Atum were regarded as the father of the deities and pharaohs and were widely worshiped. In older myths, Atum was the creator of Tefnut and Shu, and he was born from ocean Nun. 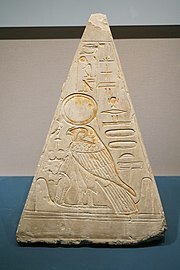 Pyramidion of Khonsu, with the image of Ra-Horakhty in the middle. In later Egyptian mythology, Ra-Horakhty was more of a title or manifestation than a composite deity. It translates as "Ra (who is) Horus of the Horizons". It was intended to link Horakhty (as a sunrise-oriented aspect of Horus) to Ra. It has been suggested that Ra-Horakhty simply refers to the sun's journey from horizon to horizon as Ra, or that it means to show Ra as a symbolic deity of hope and rebirth. (See earlier section #The sun). Khepri was a scarab beetle who rolled up the sun in the mornings and was sometimes seen as the morning manifestation of Ra. Similarly, the ram-headed god Khnum was also seen as the evening manifestation of Ra. The idea of different deities (or different aspects of Ra) ruling over different times of the day was fairly common but variable. With Khepri and Khnum taking precedence over sunrise and sunset, Ra often was the representation of midday when the sun reached its peak at noon. Sometimes different aspects of Horus were used instead of Ra's aspects. Raet or Raet-Tawy was a female aspect of Ra; she did not have much of importance independently of him. In some myths she was considered to be either Ra's wife or his daughter. Bastet (also called Bast) is sometimes known as the "cat of Ra". She is also his daughter and is associated with Ra's instrument of vengeance, the sun-god's eye. Bastet is known for decapitating the serpent Apophis (Ra's sworn enemy and the "God" of Chaos) to protect Ra. In one myth, Ra sent Bastet as a lioness to Nubia. Sekhmet is another daughter of Ra. Sekhmet was depicted as a lioness or large cat, and was an "eye of Ra", or an instrument of the sun god's vengeance. In one myth, Sekhmet was so filled with rage that Ra was forced to turn her into a cow so that she would not cause unnecessary harm. In another myth, Ra fears that mankind is plotting against him and sends Hathor (another daughter of Ra) to punish humanity. While slaughtering humans she takes the form of Sekhmet. To prevent her from killing all humanity, Ra orders that beer be dyed red and poured out on the land. Mistaking the beer for blood, Sekhmet drinks it, and upon becoming intoxicated, she reverts to her pacified form, Hathor. Hathor is another daughter of Ra. When Ra feared that mankind was plotting against him, he sent Hathor as an "eye of Ra". In one myth, Hathor danced naked in front of Ra until he laughed to cure him of a fit of sulking. When Ra was without Hathor, he fell into a state of deep depression. Ptah is rarely mentioned in the literature of Old Kingdom pyramids. 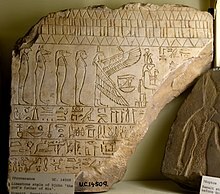 This is believed by some to be a result of the Ra-worshipping people of Heliopolis being the main writers of these inscriptions. While some believed that Ra is self-created, others believed that Ptah created him. In one myth, Isis created a serpent to poison Ra and only gave him the antidote when he revealed his true name to her. Isis passed this name on to Horus, bolstering his royal authority. Apep, also called Apophis, was the god of chaos and Ra's arch-enemy. He was said to lie just below the horizon line, trying to devour Ra as Ra traveled through the underworld. ^ Hess, Richard S. (1993). Amarna Personal Names. Eisenbrauns. ISBN 9780931464713. Archived from the original on 2017-12-16. ^ a b c d e f g h i j k l m n Hart, George (1986). A Dictionary of Egyptian Gods and Goddesses. London, England: Routledge & Kegan Paul Inc. pp. 179–182. ISBN 978-0-415-05909-1. ^ Kemboly, Mpay. 2010. The Question of Evil in Ancient Egypt. London: Golden House Publications. ^ a b c Hart, George (1986). A Dictionary of Egyptian Gods and Goddesses. London, England: Routledge & Kegan Paul Inc. pp. 172–178. ISBN 978-0-415-05909-1. ^ Della-Piana, Patricia (2010). Witch Daze, A Perennial Pagan Calendar. p. 151. ISBN 978-0-557-76333-7. ^ Quirke, S. (2001). The cult of Ra: Sun-worship in ancient Egypt. New York: Thames and Hudson, p.144. ^ a b Hart, George (1986). A Dictionary of Egyptian Gods and Goddesses. London, England: Routledge & Kegan Paul Inc. p. 6. ISBN 978-0-415-05909-1. ^ Wilkinson, Richard (2003). The Complete Gods and Goddesses of Ancient Egypt. London: Thames and Hudson. p. 164. ISBN 978-0-500-05120-7. Archived from the original on 2016-09-05. ^ a b c d Hart, George (1986). A Dictionary of Egyptian Gods and Goddesses. London, England: Routledge & Kegan Paul Inc. pp. 54–56. ISBN 978-0-415-05909-1. ^ a b c d Hart, George (1986). A Dictionary of Egyptian Gods and Goddesses. London, England: Routledge & Kegan Paul Inc. pp. 187–189. ISBN 978-0-415-05909-1. ^ a b Hart, George (1986). A Dictionary of Egyptian Gods and Goddesses. London, England: Routledge & Kegan Paul Inc. pp. 76–82. ISBN 978-0-415-05909-1. ^ Harris, Geraldine (1981). Gods & Pharaohs from Egyptian Mythology. London, England: Eurobook Limited. p. 26. ISBN 978-0-87226-907-1. ^ The World Almanac and Book of Facts 2011. p. 708. ^ Harris, Geraldine (1981). Gods & Pharaohs from Egyptian Mythology. London, England: Eurobook Limited. pp. 24–25. ISBN 978-0-87226-907-1. Wikimedia Commons has media related to Ra. This page was last edited on 13 April 2019, at 18:53 (UTC).